Helloooooooooo my lovelies, it's only me, the obsessive stitcher in the Attic. I actually had another post all lined up ready to share with you today, just some snippets from the past week as I've been home with the family enjoying a really relaxing Easter break. However, as there exists a pressing need for me to share all the ins and outs of my Creative World, and as my latest stitching escapade has a time limit placed upon it, this just couldn't wait another day. I've decided to join in with a bit of an embroidery stitch-a-long hosted by the team at Mollie Makes. The above image popped up in an email a few days ago and although I'm still eyeballs deep in my cross stitch phase, there was something about the glimpse of this sweet Spring hoop that captured my heart. So I've decided to try and give it a go, mainly because I've just packed away my Winter mantel decs and I fancy seeing something pretty and spring-like sitting on my mantel for the next month or so. I figured this would be a beautiful project to celebrate Spring as part of my "Making the Seasons" monthly project. This embroidery was designed by Anne Oliver who I've discovered writes a lovely stitchy blog called Lolli and Grace. The idea is that every day this week (five days in total) there will be installments of this stitch a long released online - you can read more about it all HERE. The only thing is that each installment is available initially for a 24 hour period, hence me writing this in haste to tell you about it in case you fancy joining me. You can download/print the parts when they appear and save them for when you are ready though, and I think there will be a couple other opportunities in future weeks to access the info if you miss any of it this week. So day 1 was released today (find details HERE) which lists the thread colours and gives instructions for tracing the pattern and beginning the embroidery. I LOVE the design - I'm a little worried that there are some rather complicated looking stitches included, but Mollie Makes has some basic stitch info (here) and I'm sure there must be a tonne of stitch know-how online. I am excited to give it a go - it's probably not achievable for me to finish it within the next five days (I'm waiting for some white fabric to arrive in the post, so can't actually start until that comes), but so long as I remember to download the info each day then I can go at my own pace during the next few weeks. Today was warm and sunny here in Atticland and it felt like Spring for the first time this year. However, I know that Spring doesn't really arrive properly until the very end of the month, but today's glimpse was just glorious. I am so appreciating our longer, lighter days, and am more than ready to put Winter behind us now. I hope you're enjoying the weather where you are, and that you are feeling happy and creative - I know I am! Thank you for 10 lovely years of sharing your creative spirit with us. You are an amazing lady. Wishing you the best 4-ever.Do you think you would publish a book with your patterns, blogs and pictures? Thanks again Lucy for sharing this. Here's mine. Looks very nice but wait until you discover Yumiko Higuchi. I'm working on one of her patterns from her book "Wool Stitch" using wool thread and floss. I'm completely in love with her patterns. here is a link to a Company offering cross stitch kits designed by Caroline Rose. I think I remember that you love her designs. This is very pretty Lucy. This looks a little too fiddly for me, but I look forward to seeing the results when its completed. Thanks for posting this! I was too late to sign up but for the daily installments but I signed up for the newsletter which promises all the posts on Friday the 13th. I need something new and springlike as well. Still rather snowy where I am and I am ready for spring colors! Looks great and too complicated for my knowledge. Enjoy! I’ve joined in this too. Looks fun. That looks really pretty, and really complicated! 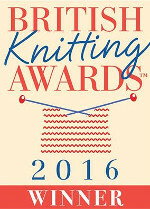 Good luck with it and congratulations for your Blog of the Year win at the British Craft Awards!